528 pages | 4 Color Illus. | 325 B/W Illus. The microfluidic lab-on-a-chip allows scientists to conduct chemical and biochemical analysis in a miniaturized format so small that properties and effects are successfully enhanced, and processes seamlessly integrated. This microscale advantage translates into greater sensitivity, more accurate results, and better information. Microfluidic Lab-on-a-Chip for Chemical and Biological Analysis and Discovery focuses on all aspects of the microfluidic lab-on-a-chip technologies and offers an overview of the available technology, its limitations, and its breakthroughs over the years. It emphasizes analytical applications of microfluidic technology and offers in-depth coverage of micromachining methods, microfluidic operations, chemical separations, sample preparation and injection methods, detection technology, and various chemical and biological analyses. Other topics of interest include the use of polymeric chips, fluid flow valve and control, single-cell analysis, DNA and RNA amplification techniques, DNA hybridization, immunoassays and enzymatic assays. 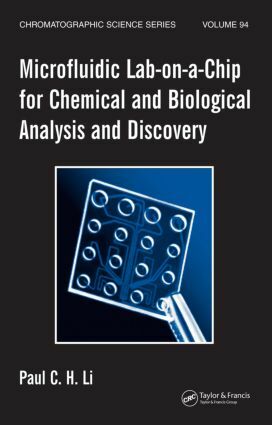 Originally conceived as a single chapter published in Ewing's Analytical Instrumentation, this book is a gateway to the vast literature and conference proceedings on the topic. Microfluidic Lab-on-a-Chip for Chemical and Biological Analysis and Discovery expands upon its roots to present a comprehensive treatment of microfluidic lab-on-a-chip methods and applications for novices and advanced researchers alike. "…truly an awesome book…This well-documented book with a multitude of references: 1/178 references are integrated throughout the book…well-written and compares well to other science books of its kind…a great book to learn about instrument design, with numerous pictures and illustrations making the text much easier to understand. Good pictures are something that is lacking in all too many science books." "In fact I can say that it is an excellent book, well thought out and written."